Government policy for the last 35 years has largely been aimed at making us a nation of homeowners. The capitalist logic behind this was that if everyone had their own house they would have property and thus a stake in the system. The theory goes that property holders don’t go on strike or take to the streets. So the floodgates to buying your own home were opened. Banks were deregulated so that they could make ridiculous loans to people without checks as to whether they could repay their loan. Millions bought into this dream of home ownership but it died the day the speculative bubble burst and banks like Northern Rock went down the plughole. Now the crisis means that the process has gone into reverse. Despite a slight increase in first-time buyers in 2014, UK home ownership ranks in the bottom 11 in the EU, below Portugal, Ireland and Bulgaria; it peaked in 2002 at 69.7% but now stands at 64.7% the level last seen in 1988 when Thatcher was promoting the ‘right to buy’. In London the majority of households now rent and in the UK as a whole the homeownership gap, i.e. the difference between those who want to own but can’t, has hit 5 million (1). Most young people now find themselves totally priced out of the market (the average London house price is now a staggering £514,000). By 2032, if current trends are realized, Britain will be a nation of private renters, something not seen since the early twentieth century. For most, the so-called dream is now a nightmare. Back in the ‘80’s, at the time the right to buy was taking off (2), rent regulations were also being dismantled. The Housing Act of 1980 meant that prices could be left to landlords to fix in accordance with the market. At that time house prices were low, making buying an attractive option, especially for council tenants who got a massive discount on their properties. This in turn led to a boom in property speculation and pushed up prices. In 1983 the average house price was £50,000; by ‘89, when the housing boom really started taking off, it rose to £118,338. By the early ‘90’s the cost of home ownership really started soaring. Base rates stood at 13.5% in 1991 and for many the cost was too great to get on the housing ladder and the bubble collapsed. At that time there was an alternative to homelessness. There was a social housing stock to fall back on and many people whose home ownership dream had failed were re-housed by the very council they’d bought their properties from. Meanwhile, inflated house prices became the norm. Those who could afford to buy were scared to wait in case prices inflated even further and this only fuelled the bubble. For some, the boom which followed generated large increases in home equity. For those left behind, buying became simply unaffordable. Between 2002 and 2007 house prices rose by 90%, faster than any EU nation except Spain. The average house price for the first quarter of 1998 was £81,722 but at the peak of the market (the third quarter of 2007) the average price was £219,256, an increase of 168%. However property prices were only part of the picture. Mortgage lending had become relatively cheap in the early 2000’s, with many lenders offering loans on increasing multiples of income; even if your house was eye-wateringly inflated, you could buy with cheap finance and mortgages weren’t closely scrutinised. But when the latest housing crash came in 2007 and lenders started tightening up, many people found themselves unable to get an affordable mortgage. And so the only option was renting. By then of course the council housing stock in England alone had shrunk by 30%(3), and the stock that was left was the most run-down and undesirable, often high density flats in poor areas. People increasingly turned to private renting. According to Shelter, in 2003, 2,549,000 households rented from private landlords and 2,457,000 rented from councils. By 2011 the numbers privately renting had shot up to 4,140,000 with only 1,726,000 left renting from councils. All of which means we now have the perfect conditions for the worst housing situation for generations. Low social housing stock, highly inflated private rents, ever rising property prices and an overall housing shortage, all a perfect recipe for disaster. At the moment those living with high mortgages are only protected because current interest rates are so low. Every time the Bank of England moots the idea of an interest rate hike they reconsider, in part because nobody wants mass mortgage defaults. Any added pressure to the already ‘overheated’ private rented market will serve to push up rents even further and out of reach of the average wage. At the moment households spend on average 28% of their weekly incomes on housing costs but this figure rises to 40% for private renters. According to Shelter, in 2013 over 210,000 households in England were at serious risk of repossession or eviction, i.e. 582 homes every day due to arrears. (4). Some 8% of rents were paid late or not at all in August 2014. As Campbell Robb, Shelter’s chief executive stated: ‘Our housing market is completely out of control and England’s nine million renters are paying the price.’ (5). Hardest hit are those on the lowest incomes and private renting. The average UK rent is £761 a month, but in London it is £1,160; it has increased 3% in the last 12 months and is steadily rising. Even the CBI are worried (because of the impact this might have on wages). According to the Association of Graduate Recruiters, the average graduate job in London pays £27,000 a year. After tax, student loans and pension contributions the average take home pay is £19,750. The average graduate in Greater London spends £17,000 a year in rent, in other words, 86% of the average net pay. As a result many young Londoners are crowded into poor quality accommodation further and further out of town. However, for private landlords, the current climate is a goldmine. They don’t have council stock to compete with and so the sky is the limit with investment opportunities too good to miss. Some individuals are making personal fortunes (Kevin Green, an ex-dairy farmer has personal wealth of £40m), but private equities and investment banks are the big players, buying large swathes of real estate, especially in London, then charging whatever they can get away with. To add insult to injury, much of the old council stock is now in the hands of private landlords (over 600,000), and many of the tenants are forced to apply for housing benefit to cover the costs. A report by Labour’s Tom Copley found that least 36% of all homes sold by councils in London are now let back to tenants by private landlords (6). In five years the value of homes held by mortgage holders in Britain has fallen by £169 billion, while that of those rented out by landlords rose by £245 billion (7). Some 800,000 in London are on council waiting lists, and many will never be successful in being rehoused. An inevitable result has been a staggering increase in the housing benefit bill. It is the most expensive working age benefit, and 85% of the rise in claims since 2009 has been from households where someone is in work. The overall bill now stands at £24.11 billion, and has increased under the coalition by £3.24 billion. It has turned into a direct transfer of wealth to landlords and employers, indirectly subsidising low wages and no matter what the coalition do to bring it down, its rise is assured and it’s estimated to increase to £27 billion by 2018/19 (8). It is as Will Self put it in the Financial Times “part of the wider asset transfer from the state to the rich”. (9) And just to rub it in, rather than tackle high rents the government has brought in several welfare “reforms”, including a total cap on household benefits and the much despised bedroom tax. This deserves a special mention, if only to highlight its stupid, spiteful and punitive nature. Faced with increasing demand on a depleted social housing stock, the government decided that in order to free up larger properties (especially in demand in London), it would impose a tax on unused or under used bedrooms. The results have been disastrous. Most tenants are losing an average of £14 a week in benefits, with housing association tenants losing on average £16 a week. One in four households hit by the tax have been pushed into rent arrears for the first time, and just over half of the 63,578 tenants of 51 housing associations were unable to meet their rent payments in the first months of the new system. According to the Independent, some 50,000 people are now facing eviction as a result, with one council tenant in three now in arrears directly because of the tax. And for those not in London, and where larger properties aren’t in such high demand, a new problem has been created; the shortage of smaller properties, especially in the North where councils are struggling to cope with rehousing. Some with young children under ten whose homes are fully occupied have been shocked to discover that their child only counts as half, making them also liable to pay. Those who have been forced to move have faced massive disruption to work and family life with children having to change schools etc. Every region in the UK has its own share of suicides as result of this appalling tax. (10) The social cost of course is ignored but the impact has been horrendous. Help to Buy or Help to Profit? The other great idea of the coalition was the Help to Buy scheme. Introduced in 2013 and designed to kick start a flagging housing market for first time buyers, so far it has yet to show any results other than to guarantee more house price inflation and make the whole problem even worse. According to the Commons Public Accounts Committee (PAC), the scheme has had no impact on housing shortage. In fact most of its success has been in the north of England and the Midlands, where the housing shortage wasn’t a problem. Its impact on London may have been minimal, but its impact on public spending has been dramatic. According to PAC the scheme has committed the government to spending £10 billion without any proof it will help new buyers. According to Labour housing spokeswoman Emma Reynolds, the number of new homes being built is still at the lowest level since the 1920s (11). Many of the properties which have been built have been snapped up by wealthy private investors, which in turn has pushed up rents even further. In fact everything the coalition has done has made the situation worse. Their policy to underwrite landlords continued with tax relief, (e.g. on mortgage interest). As a result, according to the Financial Times, Britain lost nearly 35,000 homes for households on low incomes in one year alone. Since 2010 social landlords who receive state funding to build new homes must convert some existing social rented homes into the government’s new “affordable rent” tenure but these homes are priced at up to 80 per cent of local average market rents – meaning that almost three-quarters of tenants need housing benefit to help with the cost. (12). So the bulk of state aid for housing has gone either to private landlords through tax breaks or directly to house builders such as Barratt, whose profits soared to £390.6 million in the year to 30th June 2014, and who, thanks to the scheme, can now afford to return £400million to its shareholders by 2017. Meanwhile the government has tried to lay the blame for the shortage of affordable housing on immigration. Theresa May claimed that ‘house prices could be 10% lower over 20 years if the government cut net migration to zero.’ However as Danny Dorling points out, ‘she assumes that the electorate…is innumerate as well as prejudiced. A reduction of 10% over 20 years, or much less than 0.5% a year, is negligible’. (13). Empty Homes and a Housing Shortage? Of course the housing shortage does not equate to a shortage of housing. According to the 2013 Empty Homes Statistics, there are currently 845,000 empty homes in the UK. Most are privately owned, or owned by businesses, and the number is increasing by 100,000 homes a year. The figures on historic residential sales shows that 28% of housing stock hasn’t sold since 1995. In London this problem is highlighted most dramatically in a North London street nicknamed ‘Billionaires Row.’ According to The Guardian, a third of the houses in The Bishops Avenue are empty and derelict mansions worth £350 million lie abandoned and many have been for the past twenty five years. In 2013 the street was ranked as the second most expensive street in Britain and despite their derelict state, the properties are increasing in value thanks to the housing bubble. The most ludicrous profit is being made on a row of 10 mansions worth £73 million and owned by the Saudi royal family. Despite ferns growing out of floors covered in rubbish and owl skeletons, the Saudi owners are making a significant profit. The mansions were worth up to £1.125 million when they were bought in 1988 but are collectively worth £73 million now. Most of the others are registered to companies in tax havens, allowing international owners to avoid paying stamp duty on the purchases and to remain anonymous. And this gets us to the real heart of the problem. With a low rate of profit in productive activity and greater insecurity in the financial sector property in London is seen as a ‘safe’ investment and as the flow of capital from overseas increases, so too do London’s prices. We now have a situation where land is too valuable for council tenants to be allowed to live on it. As land values rise, cash strapped councils are pulling down housing estates and selling land to private developers. As a result of investment into buy to let, London property prices have increased by 25% in a year. Luxury living especially is seen as a winner and the market is driven on by a seemingly endless supply of overseas capital. A typical example is Battersea power station, currently being redeveloped for flats. Of the first 866 apartments sold, 80% went to rich foreign buyers. 85% of all new built residential property in Central London is now being bought by foreign investors, as is 38% of re-sold ones. The point isn’t to make money from tenants any more, the property itself earns money whether anyone lives in it or not. According to Inside Housing magazine, most of the 86 apartments in the ridiculously expensive One Hyde Park development have no-one living in them (14). Empty or not, the effect is to push prices up everywhere else. And it’s being made worse by local authorities, many of whom find themselves sitting on prime real estate in cash strapped times. In London the pressure to pull down council housing and sell the land is strongest, but the push to sell is happening all over the country (15). Southwark recently sold the giant Heygate estate at a knockdown price to Australia’s Land Lease Company which means 1,100 council flats are to be demolished and replaced with 2,500 units, of which only 79 will be for ‘social rent’. In Pimlico there’s a similar story; in Battersea, Hendon, Newham, tenants are facing eviction and once out have nowhere to go. Suicide has been the response of some of those for whom there is no hope but not everyone is taking this lying down. There are signs of a real grass-roots fight back. Last year tenants in Lambeth organised a march to protest against the demolition of their homes, and in West Hendon council tenants fought back over the redevelopment of their estate which suited the developer, Barratt Development, far greater than it suited them. Last year a group of single mothers occupied an empty block of council flats in Newham, East London (close to the Olympic stadium). Their aim was to reclaim their flats after being told they would have to leave the Carpenters estate which is to be demolished. The mothers put up a brave fight for several months and eventually left the flats of their own accord before they were evicted. The women, most of them young, some homeless, some hit by the bedroom tax, have been fighting under the banner of ‘social housing for all’. They had two immediate goals: one was not to be evicted from Focus E15, a temporary hostel for young homeless people and their babies, which was due to be closed due to budget cuts; the other was to convince the council to find them decent social housing. Councils no longer have to house homeless people in their own stock (their own stock can’t meet demand), so they can fulfill their obligation by referring homeless people to private landlords, and this stock can be anywhere. 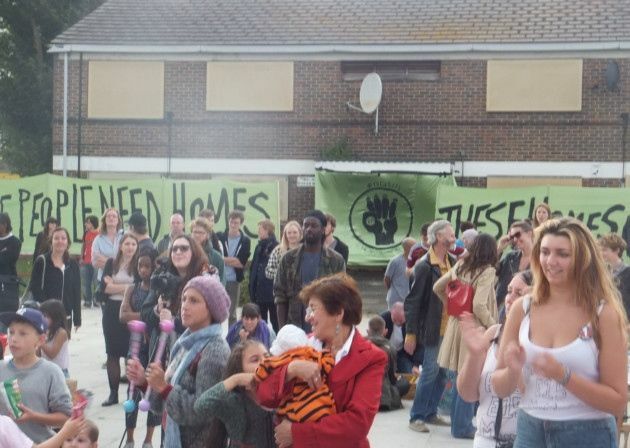 For the Focus E15 mums this meant being moved to Hastings where private rents were cheaper. (Newham recently changed its housing policy to prioritise people who work ahead of those on benefits. Although it has blamed cutbacks for its decision, it still managed to find £40m to loan to West Ham football club to move to the Olympic stadium). Eventually Newham reprieved 40 out of 434 homes, but the young mothers weren’t just fighting for themselves. As they have said throughout, they want social housing for everybody. They have vowed to keep fighting to put social housing back on the political agenda. One of the biggest victories has been in Hoxton, East London, where tenants successfully fought Westbrook Partners, a US based pension fund speculator (ironically running the pension funds of US public sector workers). It bought the 93-household estate with the help of Benyon Estates (as in Richard Benyon, Britain’s richest MP, who was later forced to withdraw from the scheme through howls of protest). Westbrook’s (and Benyon’s) aim was to evict everyone, refurbish the estate and rent it at full market value. For existing tenants this meant rent trebling from £800 a month to £2,400 for a two-bed flat. Westbrook Partners have a history of rough treatment when it comes to their tenants. In 2014 the New York attorney general ordered it to make up for thousands of building violations although he only ordered them to pay a measly $1m to tenants for legal fees and overcharging. The New Era residents, led by three mothers, organised a series of media-savvy protests (like the Focus E15 mums they embroiled the narcissist, mansion-owning multi-millionaire Russell Brand to raise their profile). They criticised the social cleansing of working class people from their neighbourhoods and eventually forced Westbrook to back down and sell to an affordable housing group, the Dolphin Square Foundation, which has promised a fair rent policy. These might look like small victories, but anyone who stands up and fights the juggernaut of capitalism and its financialisation of housing is brave and their victories well deserved and very significant, not least for those whose homes have been saved. If and as more campaigns like this emerge, the more they can link up with each other and share information and support the stronger they’ll be. The most significant thing in the immediate term is that they are not passively accepting that there is nothing that can be done to prevent our constant impoverishment. Collective struggle gives collective confidence and collective strength to all our battles. Under socialism one of the first problems to be tackled will be the housing crisis. It will be the first need to be made free. It will do this by abolishing rents and mortgage repayments overnight, giving all security of tenure. This will be accompanied by a further recognition that housing is a need and not a piece of property on which to speculate by the confiscation of all empty dwellings and second houses and using these to re-house those who need it. Housing will be organised by local communities themselves in their own associations run by all and not by some remote bureaucracy. Under these people will be housed according to their need and not how much money they have. We’re a long way off that, but in the meantime every organised fight for better housing is only to be applauded. (1) HomeOwners Alliance Report – Death of a Dream. It should also be noted that those who can afford to buy typically have to find a £29, 218 deposit and are paying 9% more for their property than a year ago. (2) The right to buy scheme was pushed by the Thatcher government but in fact selling council houses to tenants started in 1973. It was a major part of the dismantling of the post war settlement which offered decent housing to workers and became Britain’s biggest privatization, worth £40 billion in its first 25 years. (5) Quoted in the Independent 19 September 2014. ‘Not only did taxpayers fund the initial building of the council homes, they subsidised the substantial discounts offered to tenants and then – once the homes were sold – missed out on the rental income that would have covered the build costs. To add insult to injury, the evidence uncovered highlights that at least 36% of all homes sold by councils across London are now let by private landlords. Substantial numbers of these are being let to tenants who are now supported by housing benefit, while many would-be council tenants have now been forced into the private rented sector because of the dwindling supply of council homes. The consequence of both phenomena has been that taxpayers are again being charged more to subsidise higher private rents.’..
(7) Danny Dorling. All That Is Solid: The Great Housing Disaster 2014. He also points out that just 2 percent of the population are landlords — but 25 percent of MPs. (8) According to Rachel Reeves, Shadow Work and Pensions Secretary. (11) Quoted in The Guardian 18 June 2014. (12) Financial Times, August 5, 2014. (14) The Guardian, Dave Hill’s London Blog October 1st 2013. (15) Leeds City has demolished 5,093 council houses since 2000.